I confess I am addicted to soup. 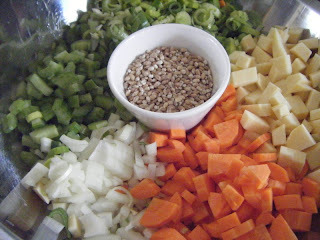 I must be as I made some this evening on a warm late December day, so totally not suited to consuming soup!!!!!! I think this is the one area of divergence that my husband and I encounter when it comes to food. (Actually there's also the fact that he happily eats black pudding and liver, neither of which I will go near!) He's just not as enamoured as I am with soup, which is quite a shame for him as when winter is well and truly here it features on the menu ALL the time!!! I am not sure what it is about soup that draws me to it so much. I love every form of it, thick creamy types, clear broth types, spicy asian types, it really doesn't matter, to me it is heaven in a bowl! My motivatiion for making tonights creation was having two big bones left over from Christmas day, which I further roasted after all the meat had been taken off and stowed away in the fridge with the intention of making something more with it. The lamb legs both had shank ends on them which I had cut off and popped in the freezer, and the recipe I found needed exactly 2 so I was set to go! 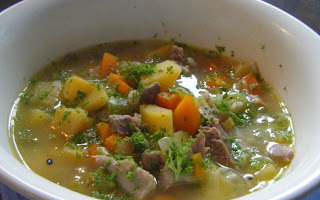 I trawled the internet for broth type recipes, knowing that lamb and barley broth was probably what I was aiming for. I found the perfect recipe by Jill Dupleix, who I am growing to really like, her style just seems to strike a chord with me. I think she has a simple, unfussy approach, big on flavour, small on effort. A woman after my own heart! I can feel some serious research needed to decide which book of hers I might like to purchase!!!!! This is easy peasy yet again but magnificent in flavour. I substituted the cabbage with celery as that was what I had in my fridge and it was so delicious I think I will stick with that adaptation! My husband even pronounced it "divine". Success! I have carefully portioned it up to go in the freezer to take out when I feel like indulging myself with no effort required! This isn't so much a soup as a meal. Long, slow cooking brings out the flavours. Combine the barley, lamb, water and salt in a large pot. Bring slowly to the boil, skimming off the froth that rises to the surface. Cover and simmer gently for one hour. Add the onion, leeks, swedes and carrots and simmer for a further hour. Add the shredded cabbage and cook for 10 minutes or until tender. Remove the lamb and finely shred the meat, discarding bones. Return the meat to the broth, heat through and season to taste. Serve hot, scattered with parsley.